Come February,sometimes late January,preparations started at home for the festival season.Our temple festival with all its pomp and glory lasts for eight days and it was a fun riot for us during childhood.It has been a while since I attended any of these functions but am glad to be home during this time and enjoying the festivities to the maximum. In a thick bottomed kadai/pan add the besan and 3-4 tbsps of ghee and mix together with your fingertips till the besan turns into a wet sand texture-this is mainly done so that when you add the ghee later on,the besan doesn't turn clumpy. Keep the pan on high flame and keep stirring.Add 1 tbsp ghee at regular intervals till you finish all the ghee-it will take anywhere between 10-15 minutes on a controlled flame(medium-high). 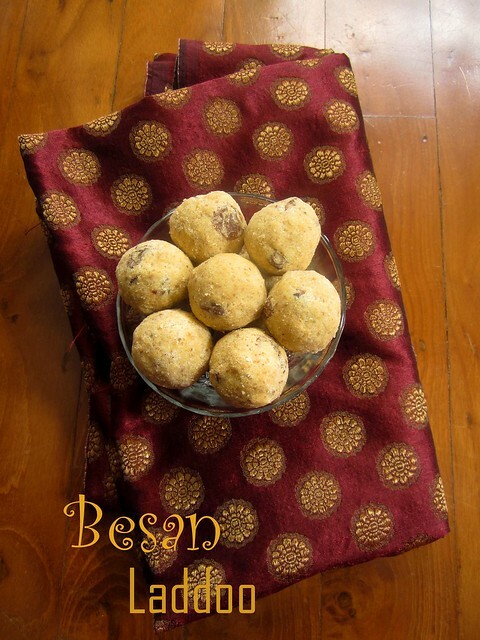 The besan should smell nutty and become a golden brown colour. 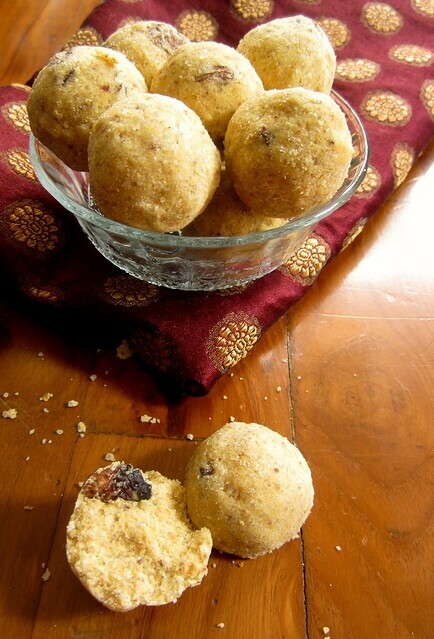 During the last 5 minutes,add the nuts and raisins and mix well.Mix in the cardamom powder. 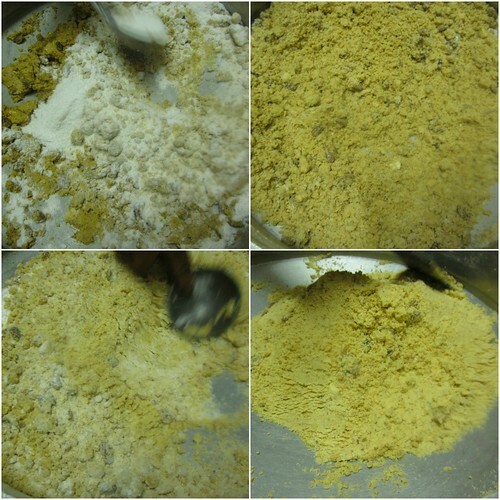 Switch off the flame.Add half of the powdered sugar and mix with the roasted besan with the back of a spoon so that it mixes evenly.Mix in the rest of the sugar. 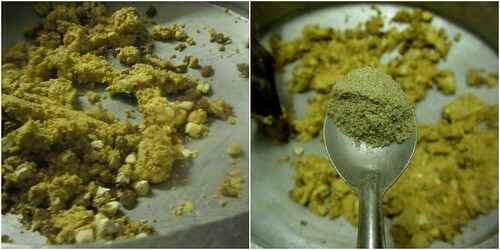 Press the mixture with the bottom of a spoon to one side of the pan and let it rest for 5-7 minutes. 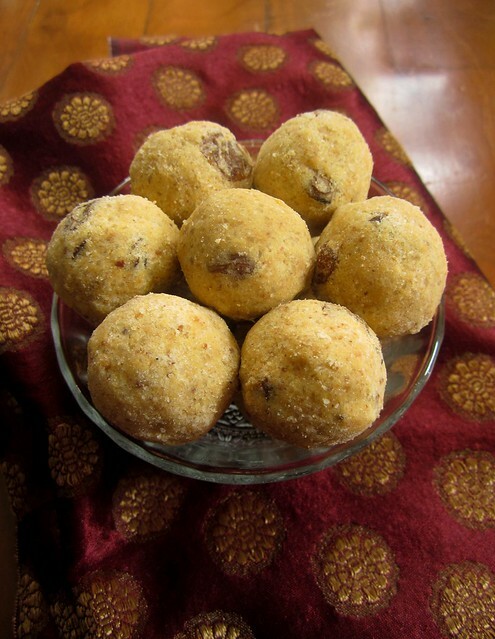 Take a tablespoonful besan mixture in your hands and roll into laddoos. 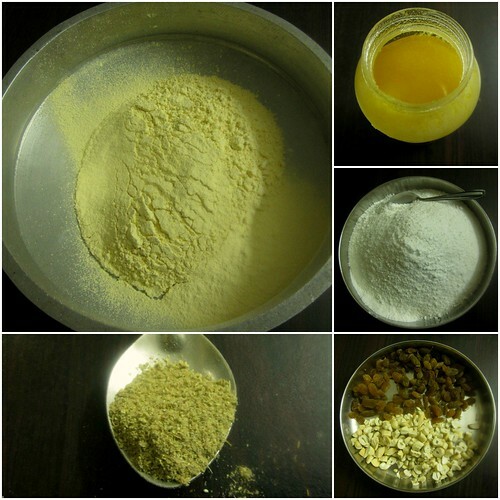 The recipe can be easily doubled or halved.The measurement should depend on the amount of besan used-double the amount sugar and half the amount ghee. 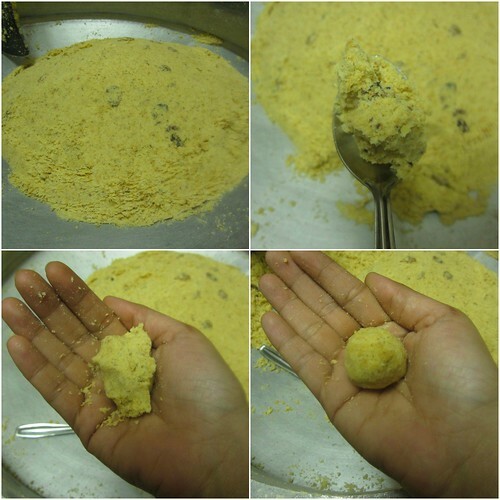 If you feel the laddoos are not binding together,add a tsp or so ghee and then bind. 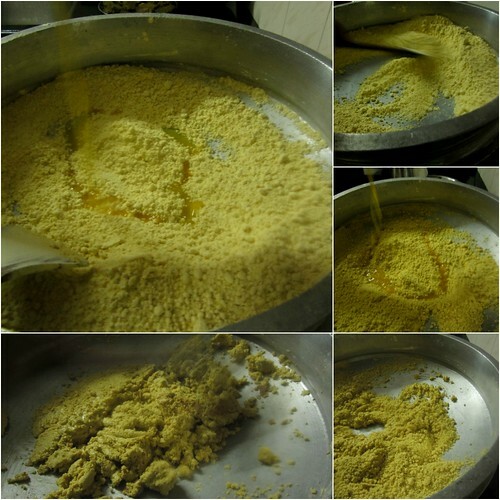 Keep stirring the besan-ghee mixture till it starts turning golden brown in colour.Control the flame throughout cooking. 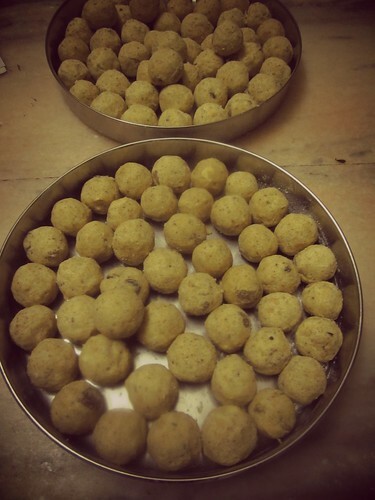 When roasted well and kept in an airtight container,these laddoos will keep well for up to 6 months. These are my favorites. Looks delicious!